By car : park your vehicle on the day area of Mambray Creek Campground 32 50 19 S 138 2 28 E, in Mount Remarkable National Park. The access is from Highway 1 between Port Augusta and Port Pirie. Fee : $10 a day per vehicle or $18 per vehicle to camp at Mambray Creek (solar hot showers). Caution: from 2014 you have to book in advance on the South Australian national parks website. Free for pedestrians and cyclists. Leave Mambray Creek Campground and follow the Mambray Creek Track. The good news is that most of the time this part has good shade, so it won’t be too hot. 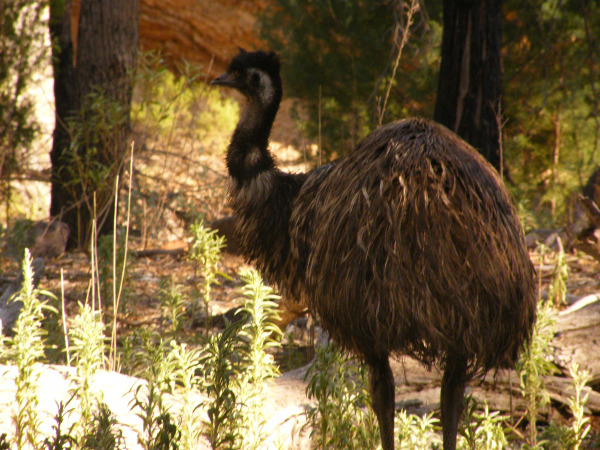 Listen carefully and you might hear an emu grunting (male) or booming (female). The booming is actually quite loud and can be disturbing the first time your hear it, as if some strange dragon was breathing behind your neck. Well emus are definitely strange creatures, but they can’t breath fire. At least to my knowledge. So don’t be afraid, as the emus will more likely be afraid by your presence and will run away at the sound of your steps. 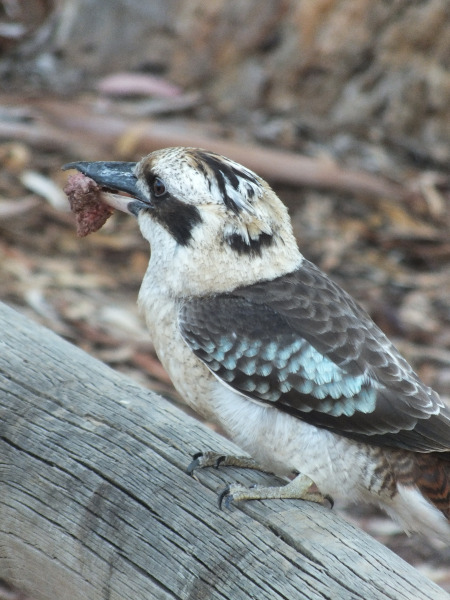 They might look a bit ridiculous with their feather mini-skirt, but beware they can attack if they decide that your sandwich actually belongs to them. After around 3 kilometres, you will turn left and leave Mambray Creek for Alligator Creek. But don’t worry though, there’s no croc here. After Pine Flat you’ll enter Hidden Gorge where the ground is harder to the feet, but also where the landscapes are breathtaking. 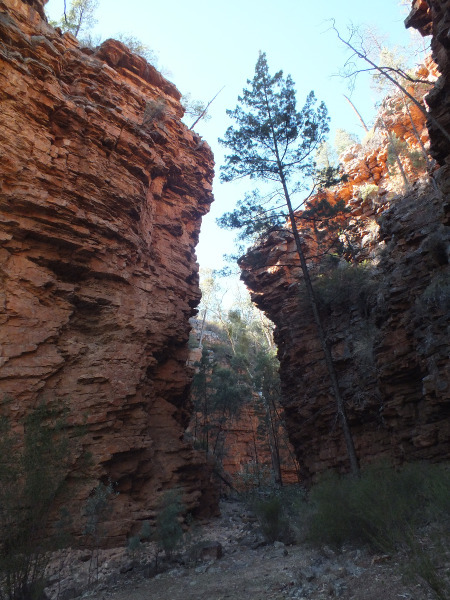 You’ll feel like a tiny ant between the large walls of the gorge, sometimes only 10 metres wide. On a couple of occasions you’ll have to climb on crumbled rocks. That might trigger some thinking in your head, like "What would happen to me if the gorge walls were to collapse right now?" The terrain is now ascending more and you will leave the cool gorge for the furious heat of the summits. After joining a spirit-less and joyless 4WD fire trail you’ll come to a water tank, which was empty the day we visited. After a long turn to the left you will be able to see up to the Spencer Gulf, thinking about swimming in cool water, while sweating horribly in the middle of the red country. After that just go down the track and join back the trail head at the Mambray Creek campground. That’s not a really hard day walk. It’s mostly flat, but it can be hard to hike the 17 k’s when it’s really hot. And even if the gorges are cool in the morning, I’m sure they can also become quite hot in the afternoon. 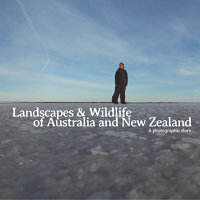 The landscapes are magnificent and unique to this area of South Australia, making this walk a must-do.